Fish Finger Sandwich: Retro Biscuit Ice Cream #1 - "Wagon Wheel"
Welcome to the first post of my "Retro Biscuit Ice Cream" series, in which I plan to make ice cream based on various biscuity snacks of yesteryear. That may sound like the worst idea you've ever heard, and you may have a valid point - only time will tell. Anyway, I thought I'd start with one of my absolute favourite childhood treats, the Wagon Wheel. According to Wikipedia they are still available, but I haven't personally seen one for at least 15 years, and they're very much something I associate with a bygone era (i.e. my youth). And speaking of food blasts-from-the-past, I had a special trick up my sleeve for making the ice cream. Remember Angel Delight? Well, I present to you... Angel Delight ice cream mix! 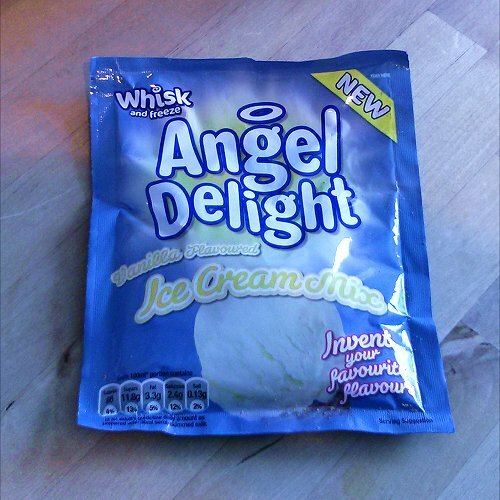 Yes that's right, a sachet of ice cream mix brought to you by those crazy cats at Angel Delight HQ. 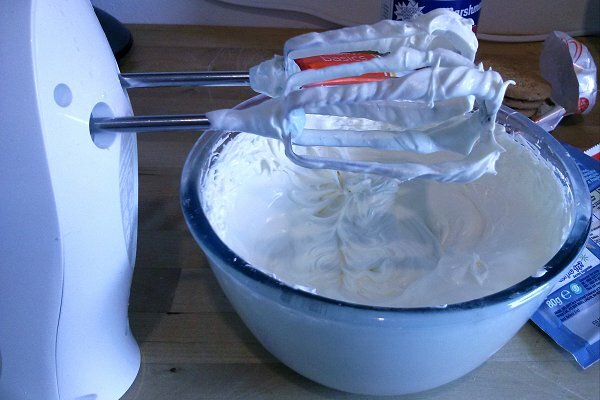 You just whisk it up with 150ml of milk until it dramatically increases in volume, and put it in the freezer. That's it. No ice cream maker, no removing from the freezer to stir every 15 minutes, none of that malarkey. It sounded too good to be true. Now for the wagon wheel inspired additions. I needed biscuit, marshmallow, and chocolate. I decided to use digestives (probably my favourite out of all the "bog-standard" biscuits), so I broke up a whole load of them and stirred them into the mixture, along with a few lumps of milk chocolate for good measure. 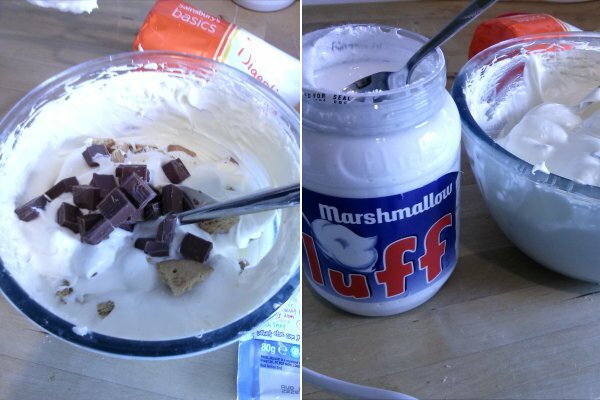 For the marshmallow, several big lumps of my old friend, Marshmallow Fluff - half a jar's worth, in total. 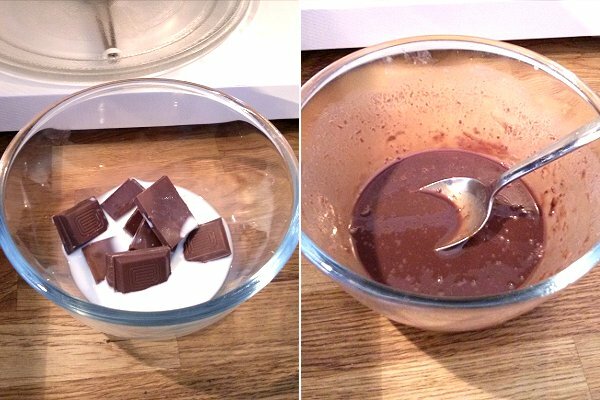 Using the remainder of the finest quality chocolate, I made a chocolate sauce by microwaving it with a little bit of milk. 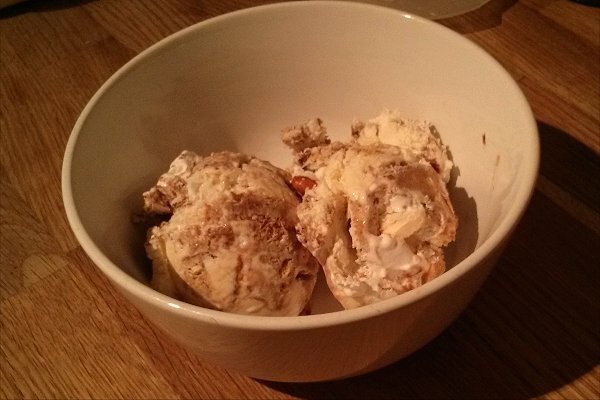 I froze the ice cream for half an hour, and then stirred in the chocolate sauce before returning it to the freezer. The ice cream is pretty light - as you'd expect from a tub of ice cream that was made from only 150ml (i.e a small glass) of milk. The texture is more reminiscent of a cheap old-school "soft scoop" ice cream, than a nice thick home-made one. 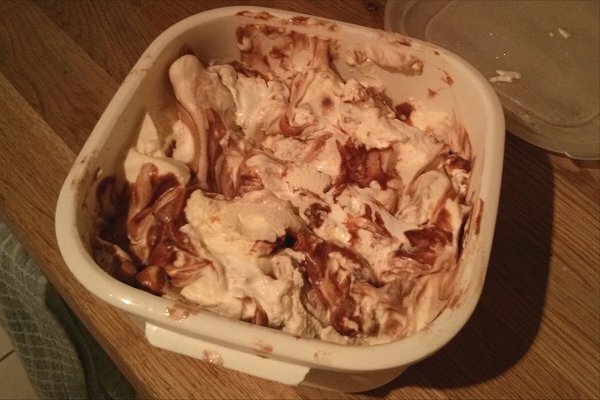 But it does taste like ice cream, and is far from unpleasant... and the combination of biscuit pieces, marshmallow, and chocolate worked really well. In fact, I really think that someone should manufacture Wagon Wheel ice cream - they'd definitely have a loyal customer in the shape of Jerry Fishbiscuits. If you have a favourite retro biscuit you'd like to see turned into an ice cream, leave a comment! (note, crap suggestions like rich tea or custard cream will not be tolerated). Had totally forgotten about Club and Trio. Viscount and United also spring to mind. Breakaway. You can still buy them. I daren't, because I'd eat them all.